Everything what I have watched since beginning the Northeastern Sojourn, so far. At the movies: The September Issue. In the worlds of fashion and publishing, few words strike as much fear into the hearts of humanity than “Anna Wintour.” Vogue’s Editor-in-Chief for twenty-one years, the grande dame of American fashion is perhaps best known in mainstream culture for the character she inspired, Miranda Priestly in the novel/film The Devil Wears Prada. But here, in preparation for its September 2007 issue (September being the biggest issue in the magazine’s year), Wintour lets a camera crew document the whole process. Early word pegged The September Issue as a delicious treat for giving insider access, exploring the various conflicts and power plays at an international publication, and for serving up a grand portrait of the last hurrah of print publishing. In the intervening two years, much has changed in the world and in the world of Vogue, and The September Issue feels more and more like a valuable historical document with each day that passes. Don’t come to this film expecting to see anything like Meryl Streep’s take on the twice-removed ersatz Wintour. The real Wintour seems to have contractually required she be photographed like Anna Karina, though she just comes off looking like Lucille Bluth. 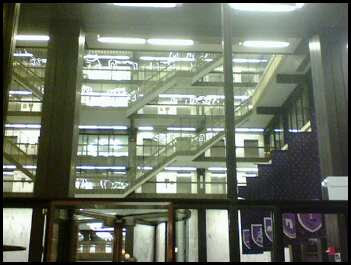 Ladies and gentlemen, the LeMarchand meets Donkey kong architecture of the Elmer Holmes bobst library at NYU. Ah, I love that place. 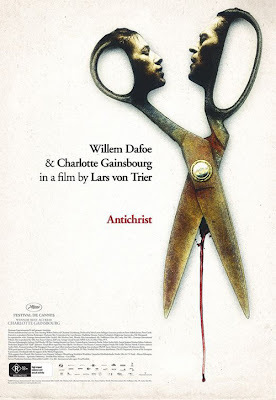 It's featured in the Abel Ferrara film The Addiction as well. At the movies: The Baader-Meinhof Complex. The Red Army Faction. In the 60s and 70s, a force of chaos, violence, and revolution in West Germany, sprung from the children of the Nazi generation who have decided to take a radicalized stance against any kind of fascism they fear imminent. It’s classic dramatic conflict, but writ large in getting at the heart of both terrorism and social revolution, as well as the question of who gets to determine which is which. Director Uli Edel (who made the masterpiece Last Exit to Brooklyn and the cataclysmic Body of Evidence) brings his a-game to the material, a must-view for students of history and human nature. With little English-language press, Edel’s film made it to the final five nominees for the Best Foreign language film Oscar earlier this year. A smash hit in Germany last year, the film’s expansive vision helps condense an involved and complex (ha!) social movement into a brisk and provocative vision about how idealism can be gradually, grotesquely unmade. The Baader-Meinhof Complex is that rarest kind of political film; one that lets its perspective evolve along with the story rather than shaping the material to fit a predetermined agenda. Even more impressive, it’s the kind of film that makes the viewer go through countless internal ideological debates, never reaching the kind of slack place where one passively lets the film unfold in front of them. Explosive, both in terms of literal content and ideological heft. Something I saw while walking down the street in Massachusetts. Nothing too out of the ordinary here. 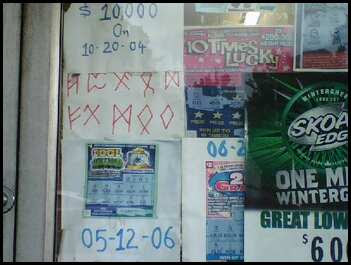 Lotto numbers, public service announcements, the usual things you'd find in a convenience store window. Except of course, for the Runes. Yes, Runes. Right there above the lotto numbers. This freaked me out. Considerably. Something I saw on the train. The book the gentleman is reading is called "Exposing the Rulers of Darkness: In Recognition of the Highest Power, Volume 2" by Iyke Nathan Uzorma. Those damned very same bikers. Apologies for the uneven Basketball Diaries footage. A remarkable marketing achievement for Mr. LVMFT. John Waters calls this the highest compliment an audience member can pay a film. I bet Lars von Trier would wholeheartedly agree. This makes me so unbelievably sad inside. I love Roxanne Shante. And I adored her story. I would even have gone to her if I lived in the New York area and needed psychiatric help from a hip-hop legend. So I don't know how to respond, except with sadness. The twenty-five best Depeche Mode songs of all time. Two and a half days until I finally see Depeche Mode live. I’ve been trying for twenty-one years. That’s right, if my wanting to see Depeche Mode in concert were a living thing, it would be old enough to legally buy alcohol. So here’s what I think are their twenty-five greatest songs. A couple are official videos, most are various and sundry live versions, and two of them could not be found anywhere in YouTube land. But taken together, it should give you an idea of both why I love this band and what an amazing pop history they’ve made over the past twenty-eight years. I specifically used this mix because I don’t think the album version is as strong of a song. It’s altogether drearier, and it doesn’t pop the way this remix does. So hats off to you, Sharam and Ali of Deep Dish. Easily the best song off their newest album Sounds of the Universe, and it’s already been dropped from the setlist of this tour. Dammit. Normally, Dave Gahan sings this song, but there aren’t any extant versions of that on the YouTube. So you can easily hear his take on the song on any of the albums (and it’s one of Dave’s best songs that he sings), but Martin’s version is just beautiful. I do this song at karaoke sometimes, because someone has to. Written by unheralded genius Alan Wilder. The song that would have caused Junior High mixtapes to be invented had they not already existed. You never outgrow this song. I’ve talked about its fascinating grammatical complexity before, but it also reflects the basic roots of any conflict with religion. Seeing them perform it before a pop crowd just makes it all the more surreal. And effective. Ivan Ivan (the madman behind I-Square Records in the 80s) did an amazing megamix of Behind The Wheel and Route 66 for the U.S. It can be found on the domestic 12” single, an extravagantly-priced CD promo, and on a 1988 Sire Records CD sampler called Just Say Yo. It is magnificent, even if you just have my word to take for it. Again, no official video to be found. So this is my favorite of the remixes. It doesn’t really give you all the lyrics (or any of them, for that matter), but if you haven’t heard “Enjoy The Silence,” then there’s something wrong with you.